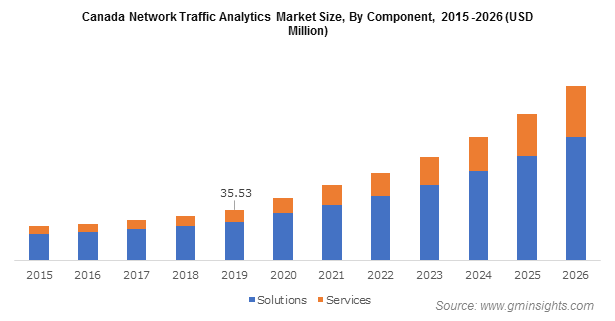 In an era dominated by rapidly evolving IT trends, network traffic analytics market has gained significant popularity owing to rapid need of network security for network utilization, data management, and organizational security maintenance. As of now, with the emergence of next-generation technologies comprising the Internet of Things (IoT), cloud computing, and artificial intelligence (AI), many companies have successfully enhanced their organizational performance. However, these technologies need to be monitored due to security threats associated with their use. In this regard, for reviewing, recording, and analyzing network operations, many end-user companies with software-based technologies have been deploying network traffic analytic solutions on a large scale. The growing awareness among the IT companies about the increasing threats of cyber-attacks has been propelling network traffic analytics industry trends from the last few years. Many service oriented companies are investing in network traffic analytics for achieving performance as well as security benefits. In addition, for gaining cost-effective benefits, most of the end-use companies have been collaborating with technology providers that could fuel the product demand over the years ahead. For instance, recently, Italian telecommunications network company, Italtel partnered with Habble to develop a cloud platform that will be used to analyze mobile and landline network traffic data for enhancing customer experience. The deployment of cloud-based network traffic analytic solutions will help network operators to develop new service bundles and its capability to monitor real-time costs and traffic-related issues will reduce complaints and investment on the customer care services. The prominent use of cloud-based platforms across myriad businesses for controlling external communications and improving administrative management is poised to stimulate cloud network traffic analytics market size. Typically, many companies have been struggling for a long time to find out the evidence for determining the root cause of network performance problems, cyber threats, and breaches. Uncovering the operational treats is becoming more challenging as threat activists have been prominently using encrypted traffic streams to hide their activities. In order to deal with this increasing challenging situation associated with suspicious network activities, leading service providers in network traffic analytics industry are looking forward to improving existing product capabilities. In regard to this, they have been establishing strategic partnerships with other service providers that could help them to combine their research capabilities very effectively. Speaking along the same line, in UK, high-speed network recording, traffic analytics hosting and playback specialist, Endace and renowned network and security operations service provider, Gigamon, have signed on a technology partnership recently. Through this strategic collaboration, they are planning to enhance visibility into network traffic for NetOps, DevOps, and SecOps teams. In line with the futuristic approach to improve network traffic visibility, both the companies will combine their analytics and security delivery platforms that would investigate security threats and resolve application & network performance issues. The development of high performance hosting for performance analytics and network security will have a positive influence on the service based network traffic analytics industry. Reportedly, with increasing popularity, the service based network traffic market will grow at an annual growth rate of nearly 24.4% over 2018-2024. Currently, networking professionals are observing two main network issues including user experience and data breaches which are going to increase over the years ahead with the surging adoption of network automation technologies. The increasing deployment of machine learning practices to proliferate enterprise performance is slated to stimulate product demand significantly. The growing concern among the IT companies about latency issues, network flows, network underutilization, and application access issues generated due to lack of security and performance improvements aids will fuel network traffic analytics industry share. The increasing adoption of machine learning, cloud computing, IoT, and AI technologies by the technology companies for enhancing work efficiency is also poised to augment the need for traffic analytics. As per estimates, by the end of 2024, overall network traffic analytics market will surpass a revenue collection of USD 2,500 million.